Welcome to Schauss Glass Universe! This limitless place is the evolving creation of artist Evan Schauss. 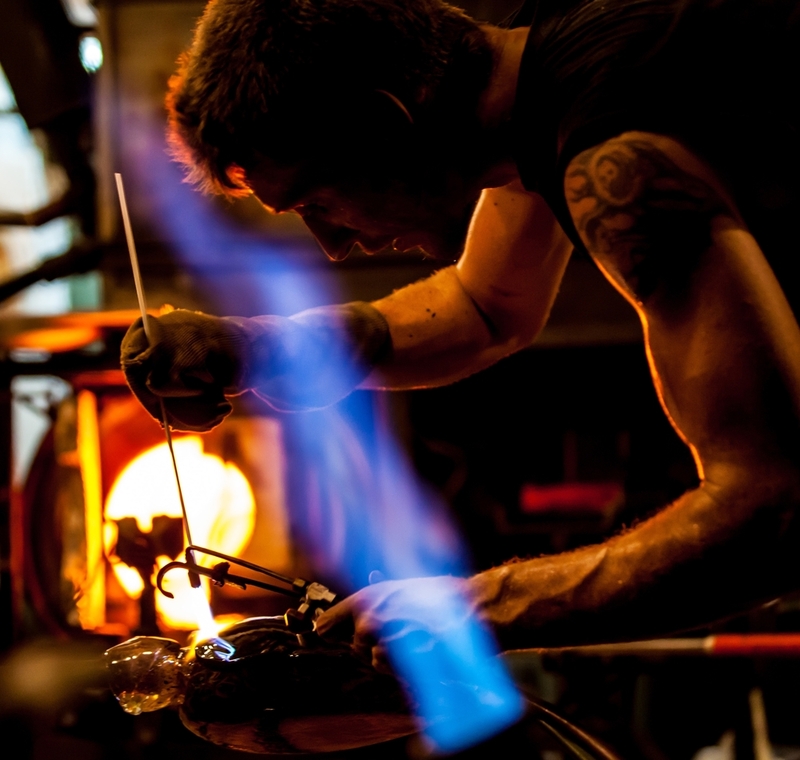 His imaginative and innovative approach to glassblowing is the result of incredible talent, training, and dedication that is elevating the art of hand blown glass sculpture to new heights! 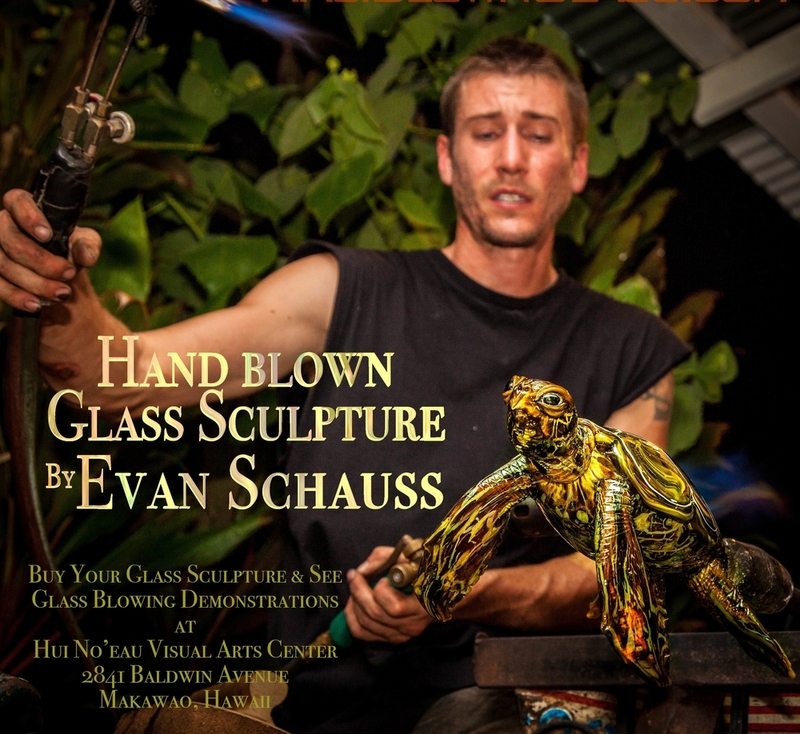 Evan began his study of glassblowing in 1998 at age 12 in Tacoma, Washington at Hilltop Artists. This program was founded by Dale Chihuly and Kathy Kaperick to connect young people to better futures using glass art. Through this program Evan had the opportunity to nurture his talent as well as learn the intricacies of building and maintaining glassblowing equipment and running a Hot Shop. After 5 years at Hilltop, Seattle provided Evan with full time emersion in his work at Martin Blank Studios and Glasshouse Studio. His passion for the craft soon led him to Italy, Hungary, The Czech Republic, and Iceland. He was honored to work with masters such as Martin Blank, Dale Chihuly, Pino Signoretto, and Lino Tagliapeitra. This helped him develop his incredible talent and success early in his career. Evan’s first self-built Hot Shop was finished in 2004 in Washington. One of his most innovative designs is an all-in-one energy efficient mobile shop. He was coveted in the glass art community for his glassblowing, shop building, and shop managing at this point. in 2007 Charles Lowrie brought Evan out to Hawaii to assist with glassblowing and shop design. By 2011 this had led him to Maui, Hawaii full time. Today Maui is where he creates his incredible art in one of his self built Hot Shops throughout the island while also focusing on inspiring future artists and giving back to the local community. In 2014 Evan began to illustrate his dedication to nurturing the positive and artistic capacities of others when he built and donated an all-in-one Hot Shop to the Hui Noe’au Visual Arts Center. This allows them to offer hand blown glass in their visual arts education program. The following year a generous grant made in honor of Ryan McQuade by the Walker family made an art program for the children of Maui Youth and Family Services possible. Through this Evan will be giving the at risk youth of Maui an opportunity to discover art, inspiration, skill, and confidence through the limitless universe of hand blown glass sculpture as he did so many years ago. Currently Evan's main studio is located at the Haiku Marketplace on Maui. This two part studio is right in the heart of Haiku and along the Hana highway. It is minutes from your drive to Hana or trip to upcountry Maui. Enjoying Evan's glassblowing demonstration and picking out a one of a kind hand blown glass sculpture is something that you cannot miss. Seeing the magic in person will illustrate how Evan's imagination and talent fuse into his glass artwork making it incredible and limitless. This universe of hand blown glass is limitless for a reason. It’s perceived limitations have been incinerated by the masters of the craft and continue to go up in flames with the contemporary glass art movement going on now. The sculptures created by Evan Schauss are the culmination of classic art, modern technology, nature, and imagination that the universe of hand blown glass has to offer. May they bring you the inspiration to break through your own limitations!